A client recently asked me to create a mushroom tart to serve with beef tenderloin for a dinner party, and this is what I came up with. It’s a basic tart, using a pastry recipe I’ve shared with you before when I posted a recipe for a Savory Spring Galette. For a base, I used a little of my Arugula Pesto, which I’ve also posted before, but you can use store-bought pesto, if you prefer. Prepare pie dough, preferably a day in advance, or at least an hour ahead (see recipe below). Heat olive oil and melt butter in a cast iron pan and sauté the shallots over medium to low heat until translucent but not browned. Add sliced chanterelles and sauté until lightly browned (about 5 minutes). Roll out pastry to a circle about 12-14 inches in diameter and about 1/8-inch thick on a floured board. Transfer pastry to a parchment-lined baking sheet. Spoon pesto onto center of pastry round and spread thinly to about 1½ inches from the outer edge. Sprinkle parmesan lightly over pesto. Spread mushroom-shallot mixture generously over pesto (if you have more mushrooms than you want, put them aside and use later in scrambled eggs or as a side dish). Fold in about an inch of pastry all the way around the tart. 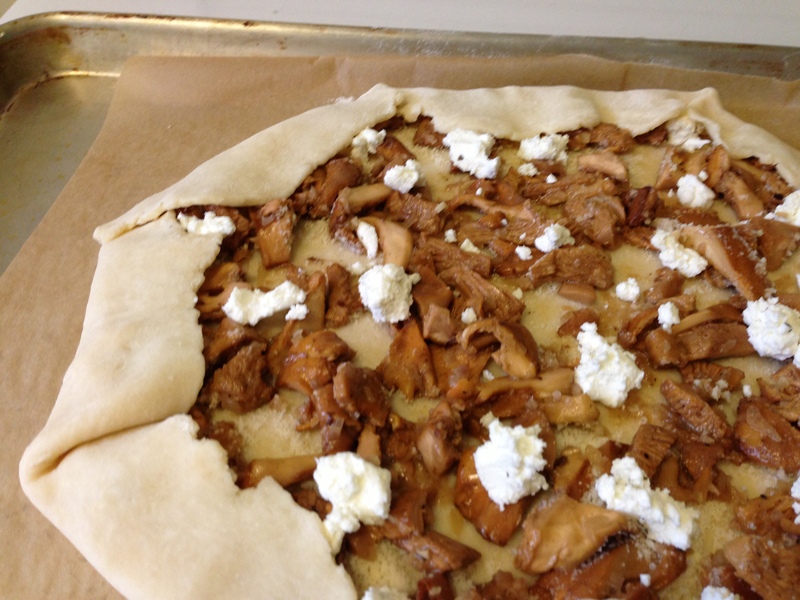 Dollop goat cheese evenly over mushrooms (as shown in photo). Brush egg over the folded pastry edge, then bake in a 350° F oven for 20-25 minutes, or until crust is golden. Note: This makes enough for a double-crusted pie. You will only need half of the dough to make your tart. Mix flour, salt, and sugar in a food processor until combined. Add shortening and process until mixture has the texture of coarse sand—about 10 seconds. Scatter butter pieces over flour mixture, then cut butter into the flour until mixture is pale yellow and resembles coarse crumbs, with butter bits no larger than small peas—this should take about ten 1-second pulses. Turn the mixture into a medium bowl. Sprinkle 6 tablespoons of ice water over the mixture. With a rubber spatula, use a folding motion to mix. Press down on the dough with the broad side of the spatula until dough sticks together, adding up to 2 tablespoons more ice water if dough does not come together. Divide dough into two balls and flatten each into a 4-inch disk. Wrap each disk in plastic and refrigerate for at least 1 hour, or up to 2 days, before rolling. Pie dough recipe is from Baking Illustrated (America’s Test Kitchen, Brookline, MA; 2004). 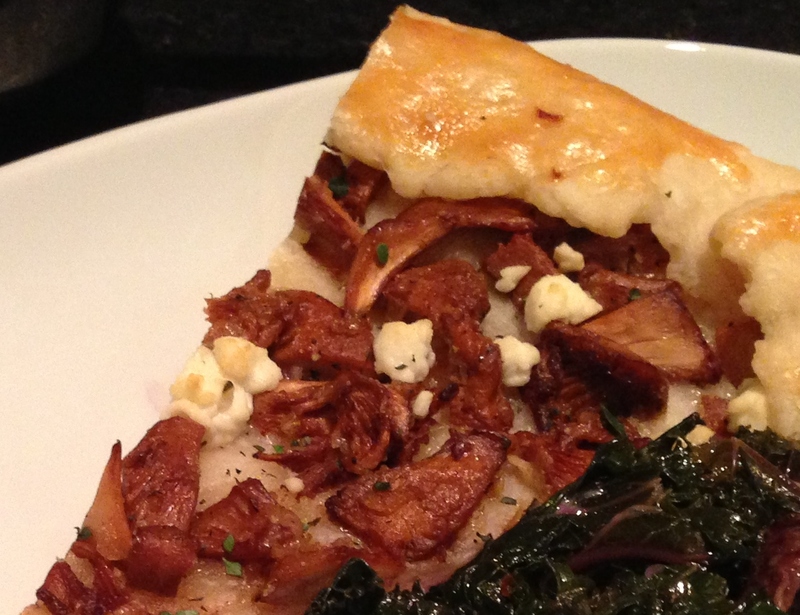 This entry was posted in Recipes, Side dishes and tagged Baking, Vegetarian. Bookmark the permalink. Tina, this looks AMAZING!!! Can’t wait to try it! LOVE! LOVE! LOVE! your blog!